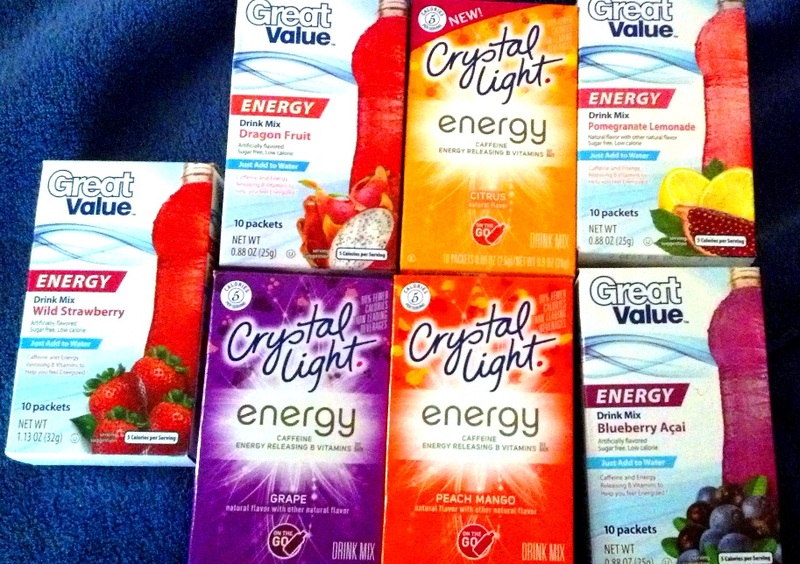 I’ve really been enjoying powdered “energy” drinks from Crystal Light and Great Value (Walmart) recently. Yeah, they’re full of artificial everything (including aspartame), but they do hit the spot. Each box comes with ten foil tubes that you tear open and dump into a half-liter bottle of water (or, in my case, a glass with two cups of water). The flavors are great, and there’s a lot of variety, which is the one feature that lures me in more than anything else. I like that I can have strawberry one day and grape the next without worrying about bottles of soda going flat (or taking up room in the fridge). These drink mixes are also cheaper than soda. Each box ($2 or less) would make the equivalent of about two and a third 2-liter bottles. And they’re a lot easier to carry home. The “energy” component is just a side benefit. Each tube has 120 mg of caffeine, so don’t go crazy chugging down bottle after bottle. I do like a little caffeine, and these cost no more than the “to go” mixes without caffeine. If these cost significantly more than the non-caffeinated drink mixes, I wouldn’t bother with them. The mixes are listed as having no carbs, but they have 10 calories per tube. In my math, that’s about 2.5 g of carbs, but they get away with saying zero by utilizing the FDA’s loose rules on the subject. If you don’t object to the chemicals and can afford the extra carbs, these are a nice little perk-up to have on hand. This entry was posted in Low-Carb Products. Bookmark the permalink.